My wife and I started off with ordering a cocktail each (the place has “cocktail” in its name, of course, we ordered cocktails!). My wife got the “Trafficking”, while I ordered the “Old Thyme Fashion”. “Trafficking” uses Chivas Regal 12 as a base spirit, but, fortunately, one cannot taste it much (I attended a Scotch-tasting in January and the Chivas Regal was easily the least enjoyable to taste (out of seven Scotches)), which was good. Although one could taste the pineapple juice (interesting: pineapple juice with blended Scotch), the mint was a more prominent flavor. 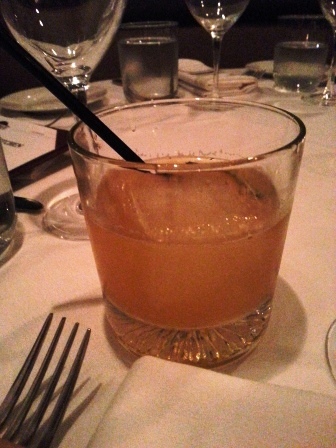 In the “Old Thyme Fashion”, which uses JP Wizer’s rye whiskey as its base, the rye whiskey is prominently featured – especially enjoyable on the nose – yet, its harshness (or, as I call it, its “edges”) were softened by the orange and lemon juices involved. 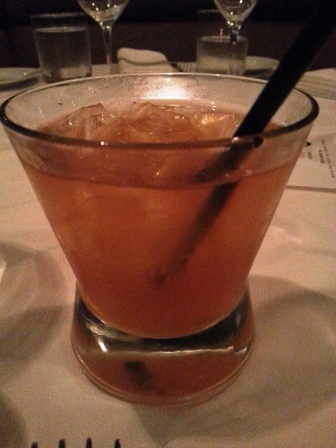 I found the orange juice to be an interesting taste involved, since it is seldom used in whiskey-based cocktails. I also could sense the bitters used. Overall, it was an enjoyable whiskey-based cocktail! Having received recommendations to try the Corned Beef Tongue and the Lamb Slider on the appetizers menu, Dani and I ordered them. The Corned Beef Tongue was yummy: a brioche bottom adds a great crunchy texture to the very soft hen egg and the soft beef tongue. I found it soft, yummy, and great. 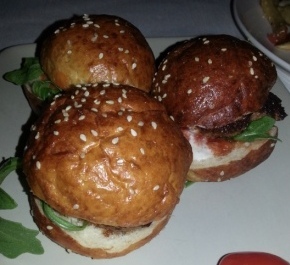 The Lamb Slider could possibly have been my favorite taste of the night, with its soft buns and chewy lamb meat. However, the taste and texture of the the tomato marmalade is awesome on the Lamb Slider and I think that it brings the sandwich together. And, also, there was a little red bell pepper(?) that added a nice little crunch, which was important for the texture. 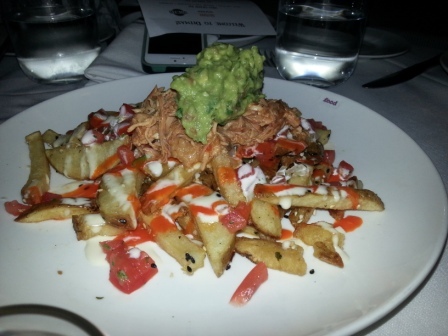 We also ordered Tony’s Fries, which were french fries with machaka chicken, pico de gallo, and guacamole. If you’re in the mood for fries, then get this dish. I was not in love with the dish, but the chicken with the pico de gallo and guacamole made for an improved combination with the french fries, but was not as good as the aforementioned dishes. Then the complementary dishes came out(!). I am pretty sure they must have known that our dinner companion was a kosher travel blogger and would be writing about their restaurant, so the chef began sending out further appetizers for our writing enjoyment. Also, at various points, the chef emerged from the kitchen to chat with our table, which was great – he was very pleasant and kind. 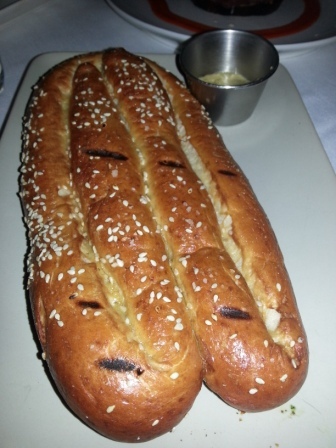 The New York Pretzel was the first dish served to us, compliments of the chef, which was a really good pretzel – it was nicely crunchy and a good flavor to match. 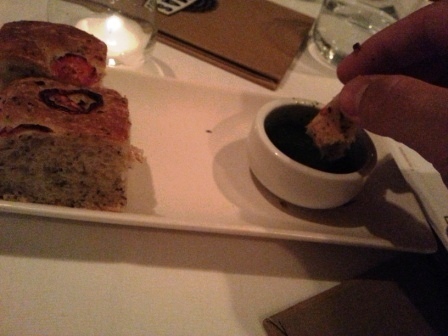 Furthermore, the mustard that accompanied it was really good – it had a nice crisp spice to it, yet not overwhelmingly so. Although we had had no interest in ordering this, it would be an excellent option for anytime, but also for watching sports…. The next surprise was receiving their Pico Grande Sushi on the house!!! In this sushi roll, comprised of spicy tuna, yellowtail, avocado, surrounded by tempura and sprinkled with a house-made sweet sauce. The spicy tuna added a nice spice to the very yummy tempura. 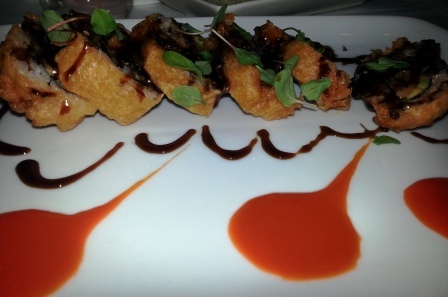 I am always a fan of the texture and taste that tempura adds. Plus, in addition to the sweet sauce drizzled on and around the sushi roll, there was some nicely plated hot sauce on the side. Then, our third dish compliments of the chef came out(! 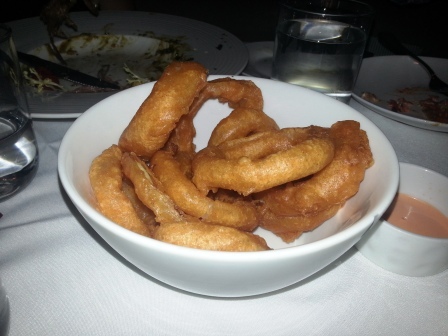 ), which were onion rings. The onion rings had a nice crunch to them and a little saltiness. There was some sauce on the side that came with it, but there was, unfortunately, little sauce from which to taste. Nevertheless, the onion rings were enjoyable on their own. Our fourth(!) 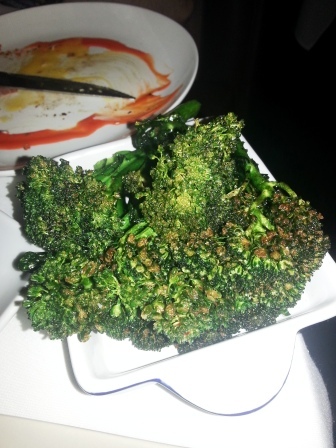 and final appetizer on the house was Broccolini on the house. I would never have ordered it, yet its crunchiness was enjoyable and happily accompanied by a sweet sauce. I thought it tasted like duck sauce, which was interesting, although the chef told us it was reduced Balsamic. Although we enjoyed our appetizers, our wives decided to get some meat entrees. One ordered the Short Rib, while the other ordered the Prime Rib. 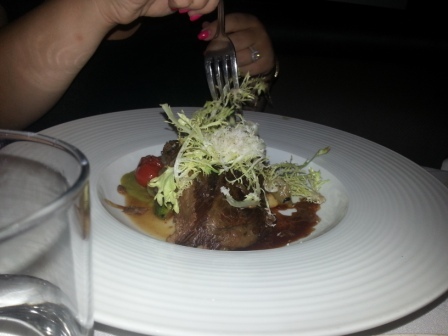 I thought the Short Rib had a nice, soft texture and a savory sauce; it came apart easily, which was great. 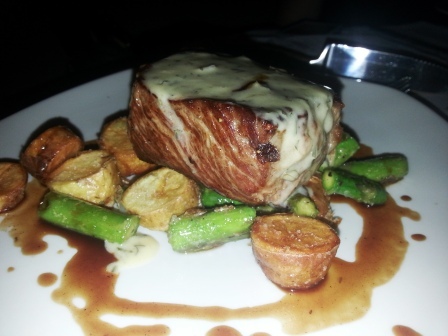 I thought the Prime Rib was soft and chewy and, with its somewhat sweet sauce, yummy. 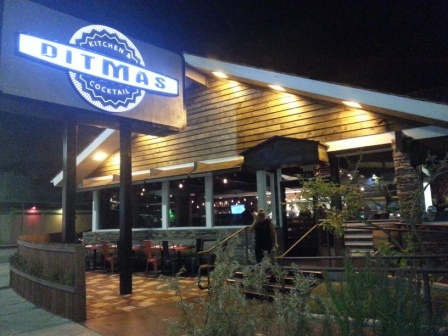 Overall, we definitely had an enjoyable time there: the food was tasty (with interesting textures, too), the chef was very nice to us, and it was fantastic to be able to taste the various offerings of this new-ish kosher restaurant! 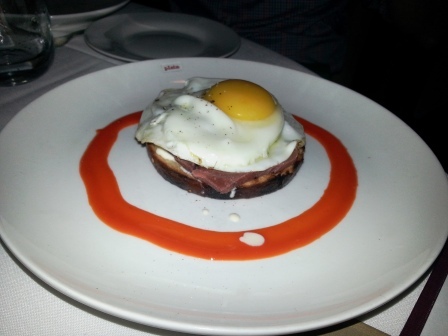 1 – Jared Sichel, “Ditmas Kitchen & Cocktail: Kosher Fare…With Flair”, The Jewish Journal (2-8 May 2014), 33.